Somehow, I don't know how, I started following an embroidery blog, Mary Corbet's Needle 'n Thread. And I liked what I saw, but transferring designs seemed really tedious and also fraught with the possibility of error, and it's not like I don't have enough stitching projects on hand already.
. . . and then, of course, I found pre-printed "coloring book" fabric in a craft store, very cheap. So I decided to give it a try, using spare floss from my stash. The fabric is "Zenbroidery", specifically the Garden print. The picture has suggested stitching, but, well, check out the big version: you could see the printing through the stitching, I just couldn't make myself do it. So I dug through the Needle 'n Thread archives for ideas, picked out some floss, popped the fabric on my Q-Snaps, and started out. It was a lot of fun at first! Not having to look at a pattern makes things flow surprisingly quickly and enjoyably. And making the vines split off and curl around was very satisfying. I'm stopping for several reasons: I don't like the colors I picked; it's too big (10" square); satin stitch with a single strand of DMC is incredibly tedious; and worst, the fabric is just awful: it's so thin you can see the brown desk underneath it, and every time I had to pick out stitches or try to set them close together, I was afraid I'd rip it. So this Overdyed Red Dragon by Dragon Dreams was a gift at Christmas 2008, a.k.a. the Christmas after people heard that I'd started cross-stitching again to make stuff for SteelyKid's room. I started it in 2010 on a scroll frame (skeletal picture), but that meant it went very slowly because I do most stitching on my lunch break at work, and bringing the scroll frame in seemed a little much. After experimenting with stitching in the hand, I took it off the scroll frame in November 2015 and brought it into work; at that point I'd finished the body through about, oh, draw a line up from the edge of the right-most claw. Up close, you can see where the stitches become a bit fuller because of the change, but I don't think it's obvious if you aren't looking for it. So I finished the body and did the metallic threads, the backstitching of the solid parts, and the belly scales. And then I came to a screeching halt when the thread I had for the wings was the wrong color—it was what was specified by the pattern, but the manufacturer must've changed the color. I went on A Quest to find overdyed thread with a lot of red, blue, and purple: made a couple of trips to moderately-local stores, ordered literally half-a-dozen things off the Internet (half of which required test stitching to rule in or out), and finally gave up and ordered the same color as the belly scales, except in silk not cotton. Way less blue than the model, but it was the best I was going to do. I do regret that I stitched the wings on the short diagonal, not the long one, which I think would make more sense anatomically, but I started with the top narrow section, had to rip out substantial portions at least twice (not counting all the test stitches), and so I was very much not in the mood to redo that entire section when I got to the first wide section and realized what I'd done. Here are some pictures! Taken with my phone, because I get very direct sunlight into my office at a certain point in the day and taking pictures with indoor overhead lighting is always unsatisfying. The fabric is a pale steel-grey/blue-ish, not white. Click to make ginormous. The designer who created the blackwork patterns for, among other things, the bookmark in this icon has all her patterns on sale at Etsy for $2 each (unfortunately this is because she has to shut down her shop because of new regulations in Turkey, where she's from). I know a few of you stitch and have admired her work before, so there you go. I'd never stitched on dark fabric before, nor with a single strand of floss (a deliberate choice by the designer, to give it an airy feel); the latter turned out to make stitching rather unforgiving, so I gave up trying to stitch in the hand and broke out the Q-snaps, which was definitely the right choice. Next up, finishing the red dragon. I am currently backstitching the body, and then I just have to fill in the wings and body and I'm done, so that's exciting. Edit: actually I took it out of storage and am way closer to finishing the body than I thought, so I think I'm going to push ahead with what, I now remember, was a kind of improvised vertical pattern, and see how it ends up. Since the spring, I've done the backing on that red-brown-gold knotwork bookmark, did a blackwork bookmark for a Con or Bust winner (no picture; it's the same as the last one here only in blue), and finished the third cross-stitch for the Pip's room—he liked the polar bears, but then he noticed that SteelyKid had THREE cross-stitches in HER room, so I promised to make him another. I modified the pattern slightly by taking out the superfluous second "Red" and stitching it over-two, adding in quarter-stitches where appropriate to smooth out the edges. This one's up for auction at Con or Bust (I'm offering a custom-made one, too). The weird waviness is it being unduly flattened by the scanner, because I tried for way too long to get accurate colors with a camera and GIMP and could not. Pattern by Teresa Wentzler (and a giant pain, it varies the height of the rows it puts in and so I had to take a ruler and pencil in lines so that I could have a proper 1 square = 1 stitch chart). Stitched over two on Antique White MCG evenweave; main stitching in silk, Caron Waterlillies, Cherry 101; satin stitch and Algerian eyelets in DMC pearl cotton size 12, Ecru (best way to do satin stitches EVER); backstitch in DMC 801 (done over one on the diagonals); shiny bits in Krenik #4 Braid Beige (013). The colors don't quite glow the way I wanted when I saw the silk in the store, but I'm pretty happy with it all the same. Revised from a comment I posted a while ago (in the last thread on the first page of comments here), prompted by tomorrow's Jonathan Strange & Mr Norrell post (no, really! Cross-stitching, slash, and a man wearing a ship on his head, all coming to a Tor.com near you.). Someone asked if I'd taught myself to cross-stitch, and I said I had when I was a kid: "Pretty much your threshold for 'looks good!' is 'all stitches go in the same direction' and 'no big lumpy knots on the back,' so it's pretty simple. => There are bunches of tips for making it look _great_ to close inspection, but start with the basics and see if you like it." I made SteelyKid three dragons for her room, which were done a few days before she was born. The Pip's two polar bears, by the same designer (Laila Ansbergs) . . . well, I took them to be framed today, and they'll be ready by his birthday too! Just, uh, his third birthday. Possibly as a result, I was in the mood for something crispy at lunch today. Walking down the interior of ExCel, I ended up having a pasty as the best apparent value, which was hot and crispy but was subtly, well, foreign-to-me in flavor. Not that I blame it! So for dinner I ended up having a sandwich from something that may have been called the Upper Crust further toward the west end of ExCel, which was ham & mozzarella heated up to melting on a sourdough baguette, and was very simple and satisfying and also not ridiculously expensive. Between panels, I went to a stitching meet-up in the fan tent, and I had such a good time. We commiserated over lessons learned the hard way, showed off projects (either what we'd brought to work on or through pictures), admired different techniques, and used the wonder of smartphones to show each other pictures when we weren't sure if we were using the same terminology. By luck I was sitting near several cross-stitchers, and now I've seen evenweave stitched in the hand, which I could never get the hang of, and which I will have to try again because it looks a lot faster. And a couple of the people were self-taught and identified as newbies, so we got to talk about things they'd like to know and give them a few tips and reassure them that they were doing fine, all would be well, and it was just really delightful.
. . . wow, I have no idea what I was going to type next, I think I really need to go to bed. Four panel day tomorrow! Breaking out one of my new dresses to give myself strength. I have finished a stitching project! And now I need something to do with it. It is a pattern of interlocking knotwork in four variegated autumn-ish colors (tan, pink, red, and green). It's designed to be a bookmark, and I could finish it that way by stitching around the edges with thread the same color as the fabric and, optionally, leaving a fringe around some/all of the sides (an example is behind the cut). However, it might be a little big for a bookmark, as the stitched area is about 2" x 8". (I would not put a backing on it, as that would make it quite thick, so finishing it as a bookmark means the back side of the stitches will be visible. They are very tidy, but I'm happy to take a picture to prove it.) It could also be framed, in which case I would leave it as-is. I stitched Christmas presents again this year, this time "Charmed Ornament" kits from Mill Hill Beads. I really liked how these came out, and they were mostly quite fun to stitch too. For all that these were fun to do, I'm taking a break from stitching gifts this year, because I haven't made any progress on my other projects. Oh, and if anyone wants the leftover beads, let me know. I can look up the precise types if necessary. Claimed! I have just mailed off the last of my commissioned bookmarks for con_or_bust, which makes it a good time to take stock of my stitching projects and their status. Two cute polar bear designs for FutureSibling's room, "Hide and Seek" and "Make a Wish". These are by the same designer as the dragons I did for SteelyKid's room, which seemed appropriate (also saved me a lot of searching for good patterns). I feel bad about not putting these first, since FutureSibling will be here before Christmas, but, well, it's not like infants can see that far for the first little while anyway. Then I have two big projects and some travel projects. The big projects: I am still theoretically working on this red dragon, which is actually not that difficult or lengthy a project, it just lives at home [*] and hasn't had deadline pressures associated with it. And when I'm done that, I have Teresa Wentzler's Celestial Dragon waiting for me, which I really want to do: it's going to be so much work but so amazing when it's done. [*] I do a lot of stitching either at lunchtime at work (in less hectic times) or when traveling. At some point I may just give up and bring the stand frame into work and keep the little projects for home. The travel projects: a while ago, I started one of these knotwork bookmarks (second from right on the bottom); I really like the colors I picked and look forward to finishing it. I also would like to eventually do one each of these blackwork bookmarks; I've done six so far, and have pictures of five up at the LJ cross-stitch community. There, that's all sorted and set out for easy reference. What are you all working on, craft-wise? 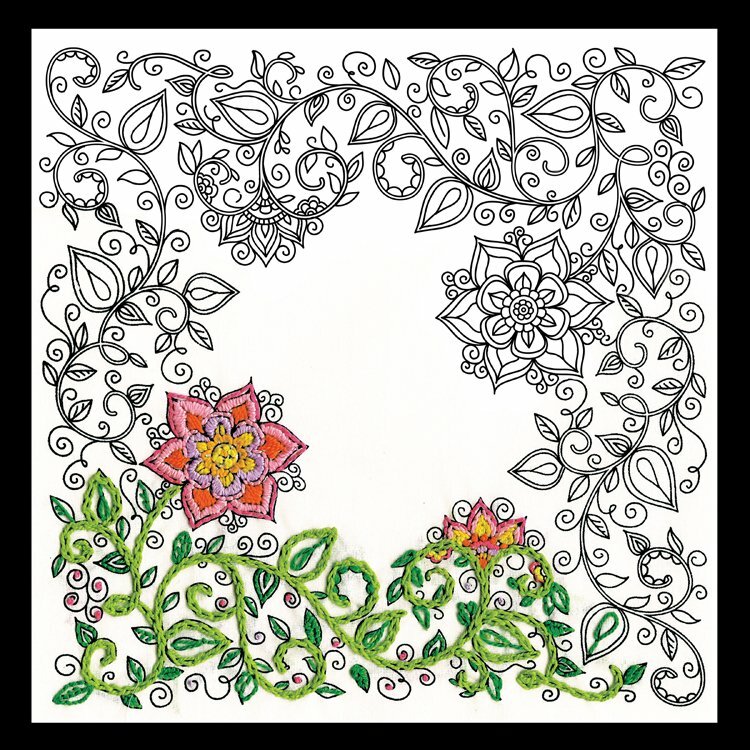 Via cross_stitch, a site with a lot of free cross-stitch and blackwork patterns. I particularly like this bookmark, which is sadly appropriate at the moment. Because clearly what my spatial-ability-deprived self needs in order to do nice clean reversible blackwork is to photocopy the chart really really big and take a pencil to it. Also, wow do I not love Caron's cotton floss. But all that is for a later time. Now, bed. News flash: gridding fabric is even more boring than I imagined. Bonus: I'll have to do the same for the chart, too. At least there I can use a ruler. I'm not actually convinced that this will end up saving me time on the current project, but at least it will give me practice with the technique for when I tackle the next, much more difficult one.